There is something about this dish that is so incredibly good. There’s all of these different, simple components that combine into one perfectly tasting St. Patrick’s Day side dish. 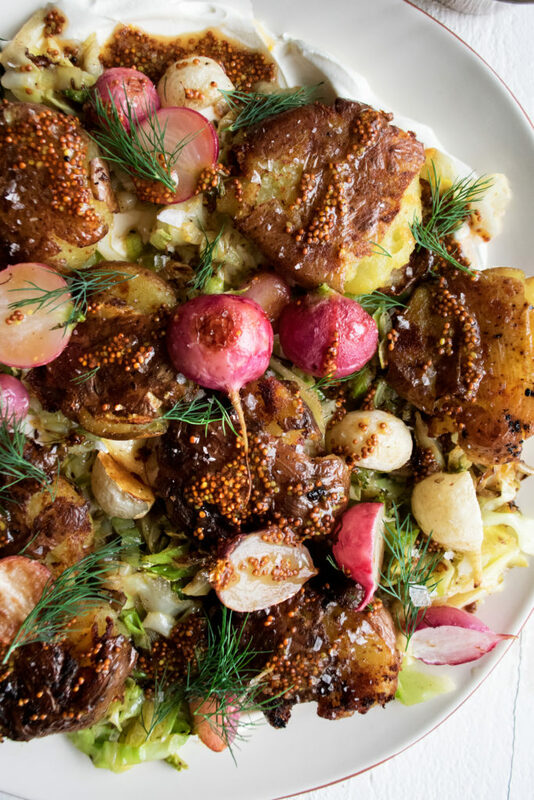 The crispy edged potatoes mingle with the rich, buttery cabbage. 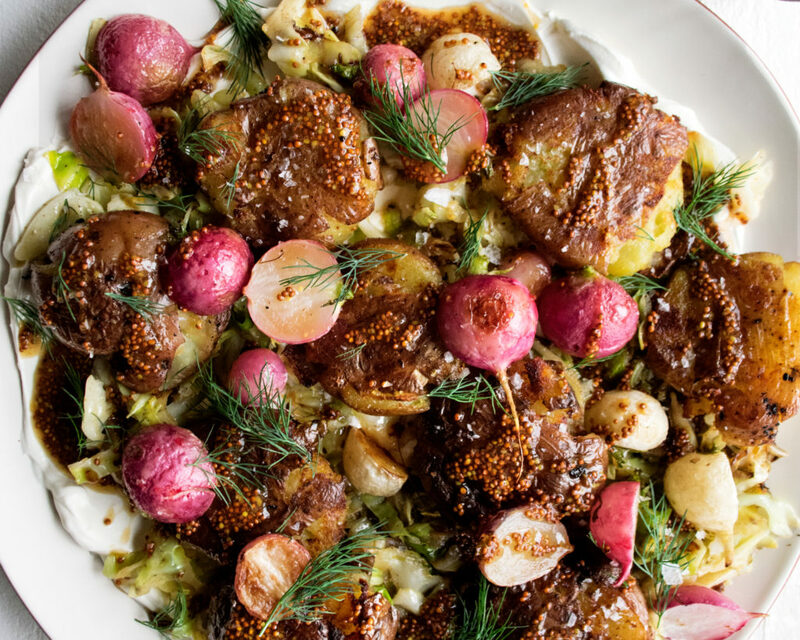 Slightly bitter roasted radishes are added to the mix for more texture and stunning color. Everything sits on top of a bed of sour cream, so that when you dive in for a serving, you get a rich coating that clings to all of the ingredients. And then the slightly sweet stout mustard sauce drizzled on top!? You just can’t beat it. We’ll be eating these crispy smashed potatoes today with corned beef and an Irish cream cheesecake for dessert. Hope you all have the best and most delicious day celebrating! Place the whole red potatoes into a large pot and cover with cold water. Add a heaping pinch of salt. Bring the water up to a boil over high heat. Reduce the heat to a simmer and cook for about 15 minutes, or until just fork tender. Drain the potatoes. Transfer the potatoes to a bowl of ice water for a couple of minutes. Once cool, transfer the potatoes to paper towels and let fully dry. Meanwhile, whisk together the mustard, stout, and honey. Season with a squeeze of lemon juice and a pinch of salt. Set aside. 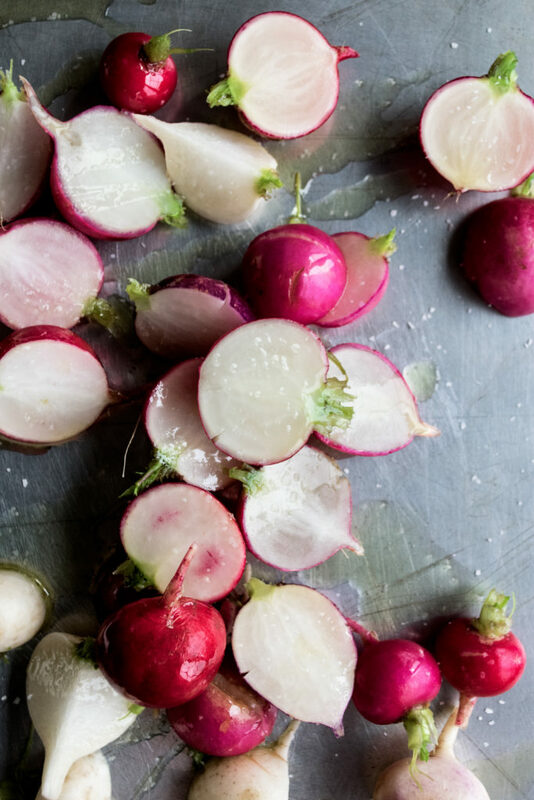 Toss the radishes with a touch of oil and a generous pinch of salt. Spread them out onto a sheet pan in one, even layer. Roast for 15 minutes. Place a large, heavy-bottom pan (I love using this Staub fry pan) over medium heat. Add enough oil to come up the sides about ¼ of an inch. While the oil heats up, use your hands to smash the potatoes flat. Once the oil is hot, place the potatoes into the pan, working in batches so that you don’t overcrowd the oil. Pan fry the potatoes until crispy on one side. Flip them over and continue to fry until crispy on the other. Lower the heat if needed so that the potatoes don’t burn before crisping. Transfer the potatoes to a sheet pan lined with paper towels. Immediately sprinkle with a pinch of salt. Continue to fry all of the potatoes. Meanwhile, heat a second sauté pan over medium heat. Add the butter and let melt. Add the shallots. Sauté for a few minutes until tender and caramelized. Stir in the caraway seeds and season with a pinch of salt. Add 1/3 of the cabbage. Let sauté for a minute or so. Add another 1/3 of cabbage and repeat. 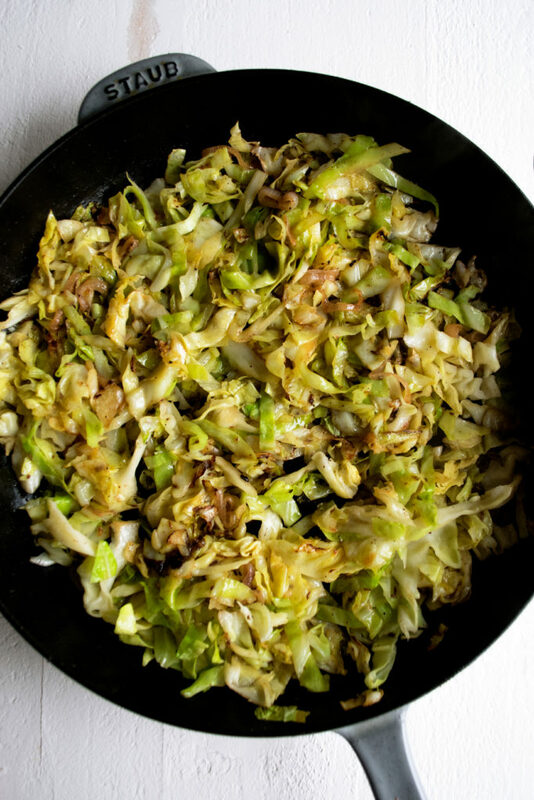 Add the remaining cabbage and let sauté until tender and slightly browned. Season with salt to taste. To assemble, spread the sour cream onto a platter. 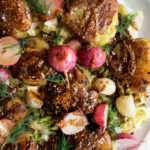 Top with the cabbage, crispy smashed potatoes, and roasted radishes. 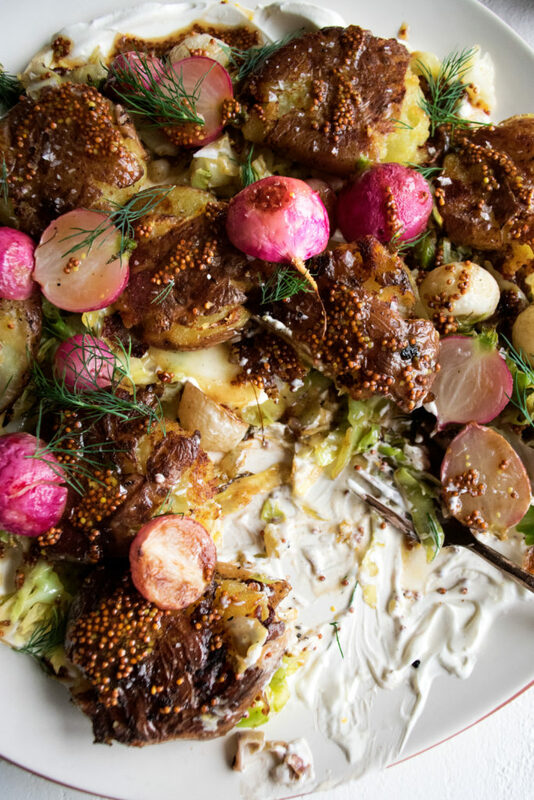 Spoon the stout mustard over top. 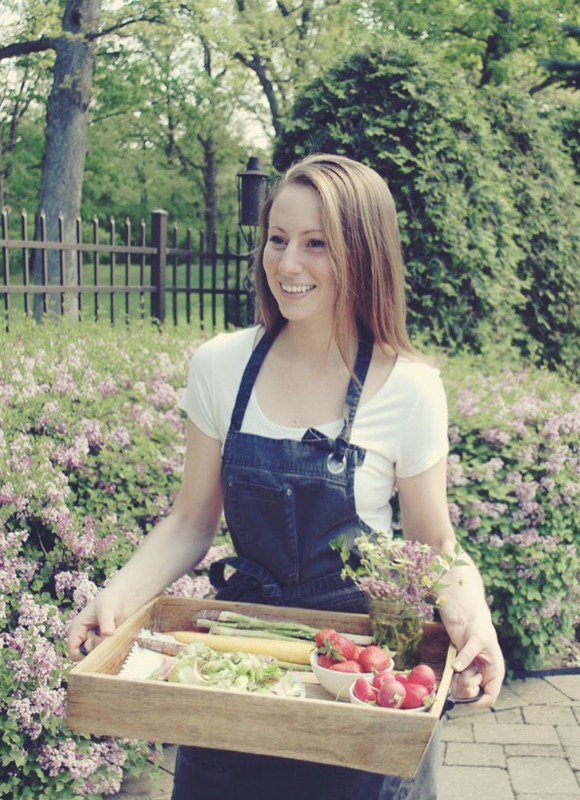 Garnish with fresh dill, a squeeze of lemon juice, and a sprinkle of flaky sea salt.